It has been interesting to watch the flurry of ethanol rhetoric since the recent elections. With the $0.45 per gallon subsidy (called the VEETC) and the ethanol tariffs both set to expire at the end of next month, both sides feel that there is a lot at stake, and they have really ramped up the rhetoric. One side will claim that ethanol is the greatest thing since sliced bread, then the other side claims it is an environmental disaster. Around and around the claims go. Misinformation abounds. I am not going to argue in this essay that U.S. ethanol policy is good or bad, but I am going to argue that extending the VEETC is fiscally irresponsible. There are a couple of issues that influence my thinking on this: (1) I think governments need to be better stewards of taxpayer dollars; and (2) I hate waste. Over the past decade, the U.S. has been on a spending binge, spending far more money than we have collected in tax revenues. That means that we are burdening our children with debt. I believe this is incredibly selfish and irresponsible. We are supposed to work to improve the future for our children, not sabotage it. So my view is that when we spend tax dollars, we need to have a very good reason for doing it. U.S. debt from 1940 to 2009. Red lines indicate the Debt Held by the Public (public debt) and black lines indicate the gross debt. I also hate waste. Wasted food, energy, money, time – I loathe them all. So any time I see wasteful government spending that mortgages the futures of the next generation, I am determined to fight it. If, however, I thought that the VEETC was actually doing something to improve the prospects for future generations, I would suggest that it was money well spent. But I don’t think that’s what it does at all, for reasons I will get into below. To review, here is where things stand. There are two pieces of legislation set to expire at the end of this year. One is the $0.45 per gallon subsidy (called the VEETC) that is paid to oil companies to blend ethanol into gasoline. Because the oil companies are also mandated to blend ethanol, the subsidy is mostly redundant. That is, we are paying a subsidy for something that is already being compelled by law. As I have argued before, it is like paying people to obey speed limits. I don’t know too many people who would think it is a good idea to borrow money from our children so we can give it back to their parents for obeying traffic laws. (You can find a more detailed discussion on the VEETC here). The second piece of legislation is an ethanol tariff that is applied to ethanol entering the U.S. market. Brazilian producers want to see that tariff removed to open up the U.S. market, and U.S. producers want to see it maintained to protect their market. For a more detailed look at the issues around the tariff, see Implications Of The U.S. Ethanol Tariff. I believe that the ethanol lobby recognizes that they don’t really need the VEETC with the mandate in place. After all, we had subsidies for 30 years, but the explosive growth in the industry only happened once the Renewable Fuel Standard (RFS) was passed into law in 2005. The RFS meant that it was no longer optional for the oil companies to blend ethanol; they were compelled by law to do it. Following the passage of the RFS, ethanol use exploded, tripling in 5 years following passage of the Energy Policy Act of 2005. In fact, growth was so fast that ethanol producers produced too much ethanol. So they went back and lobbied Congress to increase the amounts that oil companies were mandated to blend. Originally scheduled to blend 7.5 billion gallons of ethanol by 2012, the new schedule increased the blend amount to over 13 billion gallons of conventional (corn) ethanol by 2012 and 15 billion gallons of corn ethanol by 2015. So if the RFS accomplished what the VEETC was intended to accomplish, why is the ethanol lobby so concerned about seeing the VEETC extended? What I think they fear is that since a cited justification for the ethanol tariff is that it prevents foreign ethanol producers from benefiting from tax credits for U.S. producers, if the tax credit goes away then so does that cited justification of the tariff. Then, corn ethanol has to compete against imports. This is something that corn ethanol producers do not want, so they lobby to keep the VEETC, which then gives them cover to argue to keep the tariff. It has been interesting to watch the shifting strategies of the ethanol lobby. Initially, they distanced themselves from the VEETC, saying that it really benefited the oil companies. When it became pretty clear that the oil companies couldn’t care less, they started talking about jobs, foreign oil, etc. All of that was irrelevant with respect to the VEETC, because the mandates ensured that any benefits (e.g., displaced imports) would occur with or without the VEETC in place. Later there was some dissension in the ranks, when Growth Energy suggested (as I had long suggested) that perhaps the subsidy no longer serves the function it was designed for, and perhaps some thought should go into using some of that money for developing infrastructure for E85. One thing I wanted to comment on is that these are clearly talking points that one of the ethanol lobbying groups has sent out. How do I know? They once sent out talking points related to something I wrote, and they had the same characteristics. People suddenly start to show up parroting the same line of defense. I have now seen the above argument — in almost identical style and making the same claims — popping up in lots of places where people are critical of the ethanol subsidies. The idea is to simulate this big, grassroots movement in favor of continuing the subsidy. But the comments are so similar, it is clear that this was organized. ROBERT RAPIER: What is your position on the expiration of the VEETC at the end of the year? Do you object to that expiring? Would you be happy to see that expire? What’s your view? MR. SPELLINGS (XOM spokesman): I think we would be content for it to expire. We do not see ourselves as the beneficiary of that subsidy. We think in the marketplace today, that subsidy probably flows through to the consumer. We do not see how it’s a subsidy that benefits us or a subsidy that benefits ethanol refiners or farmers that produce the corn, although some folks continue to think that this is a subsidy that benefits either ethanol producers or corn producers. So let’s agree that the subsidy, at a taxpayer cost next year of $6 billion, will flow through to consumers. Now I ask you, why on earth is it a good thing to hit all taxpayers with a $6 billion bill (again, borrowing money from our children) only to subsidize fuel consumption for motorists? Why is it fair for a person who doesn’t drive to subsidize the fuel of those who do? Or for those who are very fuel efficient to subsidize those who are not? I believe with every fiber of my being that WE SHOULD NOT SUBSIDIZE CONSUMPTION OF A DEPLETING RESOURCE. If the subsidy lowers the price of gasoline, it encourages consumption. That is the exact opposite of what we should be doing, and therefore the worst possible reason for extending the subsidy. We are not only mortgaging the next generation’s future, but the money we are using to do so will cause us to consume resources that will put them at an additional disadvantage. Bob Dinneen: In the absence of the tax incentive discretionary blending evaporates. With more than 2 billion RINs through the RFS program that are out on the marketplace, they would quickly be bought up by refiners. So there’s no question that in the absence of the tax incentive demand for ethanol will fall. So let’s take that one on. What this means is that ethanol producers have overproduced ethanol to the tune of 2 billion gallons. (Remember, the last time they overproduced, ethanol producers lobbied for and received a new RFS schedule that benefited them). It means in 2011, for instance, that gasoline producers could buy and blend 2 billion gallons less ethanol (actually it is more like 1.4 billion gallons since the mandate increases in 2011) than the mandate requires. So if removal of the subsidy caused ethanol to be more expensive per unit of energy than gasoline — almost a certainty since it is more expensive than gasoline today — then demand for ethanol would indeed fall. So what? Is it the fault of the taxpayer that ethanol producers produced more than the legal requirement? Should we be in the business of encouraging overproduction, or protecting industries who overproduce from the consequences of doing so? Further, what is the price that we are being asked to pay? In 2011, it would amount to around $6 billion to protect 2 billion gallons of ethanol. Really? Someone can seriously suggest that we should pay a subsidy equivalent to $3 per gallon of ethanol (on top of the cost of the ethanol!) just to make sure ethanol demand doesn’t fall? Preposterous. Incidentally, what about Dinneen’s argument that it is simply too late in the year to debate the issue, and therefore the default position should be to extend the credits? Bob Dinneen: You can’t have that in the week or two that you’re going to have in a lame duck session. So they can extend this tax incentive with, you know, a stroke of the pen, a little bit of Whiteout, just change the date. That’s what they need to do this year and let’s have a robust discussion about future biofuels tax policy and make sure we’re thinking about it in terms of what’s the best policy to promote cellulosic ethanol? So it should be clear that Dinneen isn’t interested in having a debate. His strategy is to stall, delay, and then claim it is too late for debate. Top it off with a bit of fear-mongering on the horrible consequences of not extending the tax credits, and you have the stale, backward-looking strategy that he has used for years. I say enough. If it is too late to have a debate, then don’t ask taxpayers for $6 billion. We are broke. In the next post, we will examine the possibility that part of the VEETC is going toward subsidizing exports. Clearly, someone is going to have a good Christmas – either the taxpayers, or the ethanol industry, but not both. I do like the “overproduction” analysis - that means the subsidy is paying more than the retail cost of gasoline, for a gallon ethanol, where you only get 2/3 the energy value. They got thier increase in the blend to limit to E15, but under such ridiculously strict rules that hardly any gas station will bother to implement it. Time for them to start developing new markets, like diesel co fueling. Same rules should apply to them as any other business – if you want to sell something, find new uses and ways to make customers want to buy it – they have done very little work in that area. But the ethanol industry’s response is now to export the stuff – which is a clear indication of overproduction (or under development of local markets)- I look forward to the second part of this. It would make for an interesting debate in Congress about this credit – which way will the Republicans argue? I second Paul’s appreciation for another good essay post herein RR. This issue and your detailed discussion of it has deep roots here. Thank you for sharing this further research… In another five weeks or so we’ll know the outcome. This VEETC is scheduled to expire. Further wrangling which will occur will be enormous. This subsidy has been in place for three decades and I personally believe it directly supports higher wholesale rack price of EtOH. We’ll see. Happy New Year everyone. So they’re all in jail for not meeting the RFS for biodiesel, right? Did anyone at least call their mommies? For starters, may I suggest the assemblies of all the agricultural states mandate that farmers must use equipment that runs on ethanol. They always had those mandates backwards to start with. Farmers should have been the first required to use ethanol — not motorists. Sauce for the goose — sauce for the gander. Weak, Perry. Is that really the best you can do? Why don’t you address the points of the essay if you believe that I am wrong instead of posting like a petulant child? But why don’t you elaborate? When did they fail to meet the biodiesel RFS? What was the mandated amount, how much was blended, and who failed to meet it? I think you are confusing an issue here; that biodiesel production exploded far past the mandate because producers were exploiting a loophole to export their fuel. When that loophole was closed, demand fell back to the mandated levels. The RFS called for a combined 1.15 billion gallons in ’09 and ’10. It would have required 700-800 million gallons this year. What we actually got was 350 million gallons or so of biodiesel. Capacity exists for 3 billion gallons per year. I’m not being snippy Robert. I’m saying the RFS has no teeth. Blenders duck for cover in the absence of profits. Personally, I don’t care if the ethanol subsidy is kicked to the curb. It’s a good way to find out how much spare capacity oil producers really have. Kick ethanol to the curb and deal with peak oil now, rather than later. “He explained his own support for the original program on his presidential ambitions. This is the future anyway. If ethanol has a role, it will be due to its hydrogen content. Sorry, no time to sign in properly at the moment. Great post, RR. By the way, did you all see that former Vice President Al Gore is admitting that he was wrong about “first generation” ethanol subsidies, calling them “not good policy” and admitting his support of them were clouded by his presidential ambitions? If ethanol has a role, it will be due to its hydrogen content. That is the role of most fuels — their hydrogen content. That is really where the energy is stored and from where the energy is released in the exothermic reactions when fuels are burned, whether gasoline, jet fuel, methanol, acetylene, propane, dimethyl ether, fuming red nitric acid, ammonia, or diesel. This exothermic/endothermic thing is also why cracking more stable compounds such as water to release hydrogen will always consume more energy than can be gained when the hydrogen is burned as fuel. I just saw this and thought it was interesting in how one company can cause such a price spike. I think we posted somewhere in the past it was expected in the fourth quarter due to plant shut-downs. All our economics are fixed at $200 per ton…so this helps us with our payback sooner. METHANOL PRICE TRENDS. CHINESE METHANOL PRODUCTION FACING CHALLENGES. participants’ strategies and has capped a recent spot surge. average October contract level of 108-109 cents/gal. continuously growing strong demand and high levels of imports. Except, water can’t be burned. If we don’t crack it, the energy it contains is useless to us. Fact is, we can crack it, and we can crack it with renewable sources of energy. We have the means to produce all the hydrogen we’ll ever need domestically. We can do it cheaply with our abundant reserves of coal and natural gas. We can even sequester the carbon in the process. But, when those resources aren’t cheap or abundant any longer, we can always make H2 with good ole American sunlight and water. If the goal is to wean ourselves off oil, hydrogen is the best way to go. If the goal is to not consume energy in the process, we should probably stick with what’s not working. Except, water can’t be burned. If we don’t crack it, the energy it contains is useless to us. Of course water can’t be burned. That’s why you have to ADD energy to crack the water molecules apart. Then when you burn the hydrogen and oxygen atoms you get some of the energy back — but you can never get back as much energy as what you began with. 1. Cracking water molecules apart is endothermic. 2. Burning hydrogen to release energy is exothermic. 3. The Second Law of Thermodynamics says you will never get back as much energy as you started with. More excellent commentary by RR. BTW, it is remarkable how blogs–better blogs, obviously–have become the real sources of information on energy and the economy. I know of no better source for general and topical energy information than RR’s blog. The Second Law of Thermodynamics says you will never get back as much energy as you started with. Who says we want, or need, to get back as much energy as we started with? What we want is energy independence. What we need is to get energy from a useless puddle of water into our fuel tanks. Do I care if it takes 100 btu’s of energy to get 50 btu’s into my car? Not really. Btu’s aren’t in short supply. Oil is. No surprise about Al Gore – you have to play the game as it exists, not as you would like it to be. How different would things be if the presidential race started in California, or NY or Texas? That said, I’m not ready to call ethanol a failure, far from it – at almost 7% of gasoline consumption (by energy) it is doing something. It’s just the subsidy and politics around it that are the problem. What would have been (and still would be) a better way to go would be to replace the RFS with a wider “Alternative Fuel” standard. The gasoline would have to contain 10% or 15%(by energy) that has come from non-oil sources. This could be ethanol, methanol, butanol, or synthetic gasoline by GtL or CtL or biomass -to-Liquids (methane sourced hydrogen for oil cracking does not count, as it is a necessary part of oil refining, not an alternative). The subsidy is then applied equally to all the fuels, on a btu basis, or none, and of course, is paid back on any exported alt fuels. Then, the government is not picking winners, and we would see more development of the alternatives. A refinery that already has methane reforming equipment might be able to build a Bintulu style plant next door, for substantially cheaper than a stand alone site. A schedule is set to raise the % in 5% increments over the coming years. Of course, better still than a subsidy is a tax on oil (or imported oil, though that is a different issue), and a tax exemption for the alt fuel content, but chances of that are about as good as cold fusion. Even though CtL and GtL are not “renewable”, they do replace oil imports, which is far more important and urgent. With some real competition out there for ethanol, we could expect some greater efforts from them on market development, particularly in the farm states. It would have required 700-800 million gallons this year. What we actually got was 350 million gallons or so of biodiesel. I don’t know how the RFS is set up for biodiesel, but I do know how it is set up for ethanol. It definitely has teeth. If you fail to meet your ethanol obligations, you are in violation of EPA regulations. I can tell you with 100% certainty that blenders aren’t going to blow off their obligations and then throw themselves at the mercy of the EPA. Not going to happen, so it is a fanciful scenario to imagine that without the VEETC the RFS mandate for ethanol won’t be met. As shown above, even Dinneen admits that. Who says we want, or need, to get back as much energy as we started with? Common sense. Unless the original Btu’s are in a form you can’t directly use as energy to propel a car. It goes against common sense to use natural gas or fossil-fuel derived electricity and incur the thermodynamic losses of producing fuel hydrogen, when natural gas and electricity make fine direct auto “fuels” in their own right. A hydrogen production plant embedded with either a fission or fusion reactor might make sense, although both types of reactors would do a good job as direct electricity producers. It wouldn’t make sense to use electricity from them only to then incur the thermodynamic losses of producing hydrogen plus have to deal with the difficult logistics of handling the hydrogen. Or, as you alluded to in the comment on fission reactors, if you have excess energy. I have thought that splitting water with solar might make sense if your peak solar output is greater than demand. Yes, you got less energy back than you put in, but it was essentially free energy that would have otherwise been wasted. Wendell: This thread began by re-discussing the soon to expire ethanol blender’s VEETC tax credit. Now we are off into hydrogen hallucinations!!! While nobody I know is debating that hydrogen is not the most abundant element on earth, — what people and scientists and politicians have not fully grasped is that hydrogen is the #1 element on the atomic chart of elements simply because it is the smallest ion out there. It takes a composite-wound plastic tank in the trunk pressurized to 10,000 to 15,000 psi to hold enough hydrogen gas to propel your car anywhere whether these hydrogen ions are combusted in an ICE or electrochemically converted through a fuel cell into electricty to power a electric car’s motors. Have you ever heard of a hydrogen bomb? Compressed hydrogen, even it it were free – is TOO DANGEROUS for the transportation sector. Period. Please visit with any scientist or engineer who HAS WORKED with bottled hydrogen before and you’ll quickly ascertain that quantities of hydrogen need to be firmly bolted to terra firma and not packaged for 80 mph stop and go movements on any crowded freeway. Perhaps you’d like to start a whole new thread here to begin hashing over the intrinsics of outgoing Gov. Arnie’s Hydrogen Highway Hallucinations? Arnie’s former CA EPA Energy Secretary was also confused by the hydrogen rhetoric which still abounds. What point are you really trying to pubicly convey here? I invite you to either cut to the chase or start another thread. Thanks. You have to read upwards several comments to figure out how we got here, but I was answering Perry’s entry about the hydrogen contained in each ethanol molecule being the future. But you’re right, I should have ignored his post so we could stay on topic. I shall chasten myself. Yes, agreed Mark, – we can have a whole separate thread on the few benefits and many drawbacks of H2. Since RR started this thread with an excellent piece on the few benefits and many drawbacks of the ethanol VEETC, lets stick to that. One of the things that I have never really understood about the ethanol industry is that they never seem to locate their distilleries near a source of free heat, like a power station (or some other industrial source like a factory/foundry/steel mill, etc. Not only would it save them money, but it does make the fuel more “renewable” by using waste heat. Why is “renewable” important? Well, it’s not, but the mandate is the Renewable Fuel Standard, yet the fuel is produced with non renewable energy (nat gas), and could really be considered a ” gas-to-biomass-to-liquid process”. And if we are going to mandate a product like that, why not admit that renewable is not the goal, and have the mandate cover a straight gas to liquids process, and other alt fuels? OR, if it is to remain “renewable”, then give the following challenge to the ethanol industry; They can keep their VEETC, but it is reduced by the energy equivalent of non-renewable fuels used to make it. So if a distillery uses nat gas (or coal) energy equal to 50% of its ethanol output, it only gets 50% of the VEETC. You could extend the concept further (with some complication) by having a standard figure for fuel +fertiliser energy input to growing corn, which reduces the VEETC paid accordingly. IF the distillery can show that its growers are using less fuel and fertiliser than this (e.g. ethanol powered equipment, and sewage/AD biosolids for fertiliser) then they get that part of the VEETC back. What I’m after here is that if the VEETC remains, they have to do something to earn it, as presently, it is, as RR has pointed out, a redundant subsidy. So either get rid of it, or change it so that it is not redundant and actually achieves something – which really is a novel concept for any government. Of course, neither of these options are the status quo, and are vehemently opposed by the ethanol lobby – but I wonder what the taxpayers would think. After all, the VEETC amounts to a continuous “bailout” of the ethanol industry. Even the banks and automakers only got one-offs. Yes, agreed Mark, – we can have a whole separate thread on the few benefits and many drawbacks of H2. Paul: You lay out some very interesting ideas about alternatives to ‘reinstate’ some new aspects of a soon-to-expire VEETC ethanol credit. Perhaps there are far more readers to this column simply looking for new ideas than those who take the time to share their opinions and knowledge? Funny, I thought the same thing. I posted this last night, and just knew I would wake up to half a dozen Rufus comments. If we don’t hear from him soon, I will have to start checking his other haunts to make sure he is OK.
Hydrogen is the first element on the ‘PERIODIC TABLE OF THE ELEMENTS’ because it has one proton. Common compounds of hydrogen when we are discussing chemical energy are H2, H20, CH4, C2H6O, and NH3. Water has ionic forms of H+ & OH-. “Have you ever heard of a hydrogen bomb? Most of us think of a hydrogen bomb as a nuclear weapon with great destructive power based on the sudden release of energy during fusion of hydrogen isotopes. The element of hydrogen has three isotopes which is the number of neutrons in the atom. Fusion is very difficult and requires atom bomb to set of a hydrogen bomb. While hydrogen is more difficult to handle than other industrial gases, it is frequently transported safely. Since modern transportation involves high speeds, it is inherently dangerous. Hydrogen storage containers are much more likely to survive a crash than the human occupants. That said, the safest (in my professional opinion) alternative is biodiesel and ethanol. For short distance, BEV should be very safe. It is a fine point between which is safer and something being dangerous. If you store enough energy to drive 400 miles, you can blow up your house but not the neighborhood. But you’re right, I should have ignored his post so we could stay on topic. I shall chasten myself. To be fair, all this hydrogen talk started in the last post after this comment by Wendell. “I’ll also add that handling and storing anhydrous ammonia is much easier than handling hydrogen either under high-pressure, or super-cooled to a liquid. Farmers and farm co-ops all across the Midwest handle ammonia regularly, and most farm communities already have anhydrous storage tanks that could serve as filling stations. I’m all for staying on topic though. All those for ethanol subsidies say aye. All those against say nay. What else is there to say on that topic? How about cutting several posts off of this wonderful VEETC dialog and beginning another thread on H2 with them? Then some of us can sharpen our knives and begin paring proton’s from a hydrogen ion’s nucleus. I don’t support Nukes either and have so voiced my public opinion. Yet I’ll save my time and energy debating Kit P. about the explosive power of highly compressed hydrogen while not enjoining him in battles extolling the benefits of fission vs: fusion. Not my cup of tea. Thanks in advance. I don’t know how the RFS is set up for biodiesel, but I do know how it is set up for ethanol. It definitely has teeth. If you fail to meet your ethanol obligations, you are in violation of EPA regulations. Sorry, I missed that earlier. It’s the same RFS Robert. The penalty for non-compliance is something like $3500 per day. Unfortunately, like any good law, there are loopholes. Foreign entities, for example, can choose not to participate. The oil business has a good number of “foreign entities”. One of them recently made a boo boo off the Gulf Coast. The biodiesel part of the RFS wasn’t made this year. It probably won’t be made next year, or any other year, without some kind of subsidy. I don’t think we can expect anything different when it comes to ethanol. There are a number of “foreign entities” blending that as well. My bad. The penalty is 32,500 per day or per violation. That does sound like teeth. For domestic companies, anyway. The penalties are on page 14. The glaring loophole is on page 16. I don’t think we can expect anything different when it comes to ethanol. I have worked in the oil industry. I can tell you that no refinery manager, CEO, etc. in his right mind does a calculation and says “Hey, it is cheaper for us to just pay the EPA fines.” Nobody in the oil industry does it, because the EPA can make life very unpleasant for you beyond just the fines (which if you noticed, are subject to discretion and up to the amount of the benefit you received for violating the law). Earlier this year, the U.S. EPA proposed a reduction in the cellulosic biofuels portion of the 2011 renewable fuel standard (RFS) to between 5 and 17.1 million gallons, down drastically from the 250 million gallons initially called for in the 2007 RFS. But according to an Oct. 20 letter sent from EIA Administrator Richard Newell to EPA Administrator Lisa Jackson, the EPA’s reduced target is still too high. The EIA suggests that a more likely 2011 production total for cellulosic biofuels is approximately 3.94 million gallons. 1) Until corn ethanol critics started pointing the fact out in blogs and other articles, the public was largely unaware that these subsidies were going to oil companies. Much of the public support hinged on ethanol’s image as David trying to take down Goliath, but here David was lining Goliath’s pockets for his own gain. 2) Then came the realization that the subsidies were actually increasing the consumption of gasoline, and possibly increasing oil imports as a result. 3) The patriotism, anti-war, energy independence, argument wanes as ethanol exports begin to climb, some to the dreaded Middle East …possibly with the subsidy attached to them, which is what happened to the biodiesel industry as well. The corn ethanol lobby has also been working hard to deny that expanded corn plantings cause indirect land use change–it’s an unproven theory, a myth. On one side of the ocean, indirect land use change is a myth, while on the other side it is a serious problem that the E.U. is just now trying to address. This is relatively on point. Has anyone seen this comment recently? Has anyone seen this “MIT Report” they reference? I received this from a major refiner in the USA in the past month. Blending methanol seems to be not likely. My answer was yes, from biomass-to-biomethane-to-methanol, but it depends on the biomass source. It must be free/cheap to be economic, or be part of the algae supply chain in high growth open ponds without a focus on the algae oil/biodiesel/gasoline piece. You might be on to something here Walt. But instead of thousands of acres of energy intensive cement algae ponds to cultivate which do not exit – I’d be looking towards millions of acres of beetle-killed pine instead. Pine chips gasifiy easier than does coal and the intermediate CO & H2 syngas can next be catalyzed into MeOH the traditional way it has been done worldwide since 1923. This really isn’t a difficult energy conversion process and it has been done repeatedly on a 24×7 continous basis (in contrast to batch fermentation) with rather simple fixed bed reactors. Now I’m personally aware of your firm’s own direct process using methane without a syngas intermediate to go directly into methanol. Yet for the basis of other reader’s basic understanding, — interpret that C1 simple CH3OH methanol alcohol is nothing more than CH4 methane natural gas with just ONE oxygen atom catalytically screwed into the molecule. And then the C1 methane gas becomes a liquid C1 methanol alcohol at ambient temps and pressures. The methanol molecule features about 1/2 of the BTU’s per gallon when compared to hydrocarbon gasoline — so 2x methanol’s volume needs to be combusted for the same automobile mileage and methanol sells for less than one-half the price of gasoline. The benefits of a properly tuned engine (accomplished with a $35 FFV chip) are Indy race car-type power in your daily driver plus a biodegradable emissions stream out the tailpipe. A tanker spill of methanol along the highway is an easy cleanup. If it is burning, a simple spray mist of water dilutes and extinguishes the nearly clear flames. Simply flush remaining methanol into the barrow ditch with sufficient quantities of water and this diluted alcohol feeds bugs and green plants with a free lunch. This is the definition of true biodegradability vs: hydrocarbon oils and coals which phase separate from water on this fragile blue planet. Unlike Gulf Gushers, a supertanker of MeOH spilled into the ocean would simply dilute and feed the phytoplankton. • And that rather key oxygen atom? Oh yes, it came from boiling H2O into steam which is easily separated with a catalyst into H2 and O. • Pretty simple stuff here which is NOT rocket science although it may confuse beginners. • Fairly easy to understand too. • Yet no VEETC tax credits. Other than powering Indy 500 race cars for 37 years, methanol has been purposefully kept out of the consumer’s gasoline tanks. Thanks to all for being concerned about my health. The truth is, I’m a little wearied from the ethanol wars. They’re about over, and, basically, the good guys have won. There are going to be some plants closed/sold/etc from the ending of the tax credit, but that’s life in the fast track. That’s kind of how we roll in America, eh? Unlike, perhaps, a few, here, I have no financial interest in the ag/ethanol business. It has been merely a hobby for me. I’m still interested in it, but I don’t feel like “going to war” over it any more. Basically, I just feel that the deal is pretty much done. By next Summer gasoline prices are going to be pretty high again, and corn prices will be back into the low $4.00/high $3.00 range. I think I’m going to spend the next six weeks mostly thinking about the holidays. Cheers. A new report perhaps, but certainly not new knowledge. I hope the MIT report gains some traction with the politicos. Perhaps even Al Gore can now be converted to believe in methanol know that he realizes — and has admitted — the momentum behind corn ethanol was largely politically motivated. So as oil gasoline goes higher, you expect corn (and ethanol) to go lower? I think you are half right – gasoline prices will head north, but i can’t see corn heading that far south, unless there’s a bumper harvest or the like. Meanwhile, put your feet up and have drink of (corn based) whiskey. A new report perhaps, but certainly not new knowledge. Unfortunately, this is quite true. You can read an almost identical report on methanol, from MIT, published in “Science” in 1973 – nothing has changed in 38 years! Walt, an interesting response from the refiner, though he stopped short of saying he would use your methanol even if it is renewable. Much as I like the idea of methanol being co-blended with ethanol I think that is unlikely, or at least, unlikely to be supported by government. The oil companies may be interested, if they are allowed to use the methanol instead of ethanol, and if it is cheap enough. Even so, I doubt they would as people think methanol is corrosive, toxic, etc. I think the only way forward is for you to demonstrate the fuel on its own merits, with a dedicated vehicle fleet, farm equipment, etc. you aren’t going to get a mandate, so you’ll have to do it the old fashioned way – show that it is better and/or cheaper. Don’t know how you will (legally) get around the emissions rules unless they are already flex fuel vehicles though. Same applies to Mark’s mixed alcohols – no one is going to get the regulatory free ride that ethanol got – that was a one shot deal, and the ethanol industry made the most of it. But, there is room for more than one oil alternative at the table – somehow, it seems that the alts have been busy competing with each other (for gov and investor funding etc) and have forgotten that the common enemy is oil, and the more alt fuels that can successfully displace oil, the better. Much as I like the idea of methanol being co-blended with ethanol I think that is unlikely, or at least, unlikely to be supported by government. last night. I have not slept much. I want to try to do further research on what I have learned by the orgs promoting any positive news on methanol, but who knows, maybe things are about to change (over next 2-3 years). Dr. Arthur Nonomura, somewhat of the grandfather for algae and our Board of Advisor, helped us prepare a new technology making the perfect blend for methanol based fertilizer. We announced it this year, and it did not hurt our CAPEX much. He has been using it on golf courses, and although he is not a big fan of algae due to the enormous costs and footprint, we will be announcing a new totally integrated process that will produce foods and fuel shortly. We will be filing a patent application shortly, and then hope to demonstrate true economics that even the most hardened methanol critic “might” be willing to see it’s value after all the test data growing crops with low cost fertilizer and utilizing all the waste for fuels and chemicals. Since the DOE turned us down on a fully integrated algae based refinery…I am convinced even the most hardened skeptic will not easily ignore the integrated refinery that produces food and fuel with a mini-scale. Exxon gave $600 million for algae…let’s see how that turns out. We have our own views, but what is $600 million to Exxon or Kleiner deals…not much. If what I researched last night is true…the new ethanol might be the old methanol without Methanex controlling the Methanol Institute and who they can promote and who they cannot…at least in my opinion. Next year could be very interesting…especially if Range Fuels spins their marketing/VC money to say how great their $400 million is paying off. It seems marketing and financial engineering are the keys to these movements…and few really care about the merits of the technology. It will all be about re-election and I think under the continued threat of national security at least some legislation on flex fuels and methanol could see light. See here for some of the initial discussions I found…there is a lot more I was totally unaware of until last night. - somehow, it seems that the alts have been busy competing with each other (for gov and investor funding etc) and have forgotten that the common enemy is oil, and the more alt fuels that can successfully displace oil, the better. It might help if we could agree on what standards a fuel has to meet before we get started. There are so many double standards when it comes to alt fuels, it makes our heads spin. One of the major knocks on ethanol is energy density. Yet, some of the same folks who loathe ethanol, love methanol, a fuel with less density. Let’s set an energy density bar, and then see how many fuels can leap over it. Another irritation is perceived efficiencies. We all want to stretch limited resources as far as possible. Yet, some people prefer 50% efficient GTL over 75% efficient steam reformation of natural gas. Once again, we need to set a bar, and then see how high fuels can jump. Some of the same people who love methanol and anhydrous ammonia tell us hydrogen isn’t efficient enough. Never mind that those fuels are made from hydrogen produced through steam reformation. The third standard in this little package should be combustability. Combustability of fuel is normally a good thing. But, some hate hydrogen because it’s too combustable. Once again, where do we set the bar? Should a fuel have more, or less, combustability than gasoline? Let’s have one set of standards first. Then, and only then, can we decide which fuels get a passing grade. If we ever get a set of agreed upon standards for fuels, we can then move forward to engine requirements. Cost and efficiency standards are just as important there. A $1.00 per gallon wonder fuel is useless if it takes a million dollar motor to burn it. I agree with Rufus. I am using E10 and that is a step in the right direction. There will be the ‘my alternative that does not work is better than your alternative that works’ debate. There are a whole lot of energy ideas that sounded good when I was in high school and college. Methanol, hydrogen, and CNG are not going to make it the US alternative energy market. If you are an advocate of those technologies, I would suggest that you find the root cause of past failures rather than beat down ethanol. It seems marketing and financial engineering are the keys to these movements…and few really care about the merits of the technology. Walt, certainly some like Range Fuels have done well by this approach, however it comes to nought if the underlying technology is not sound. And even if it is sound, that’s no guarantee it will be accepted in the marketplace, as shown by LPG and CNG systems for vehicles – sound, mature technology, cost efficient even, but no average driver wants it. Methanol, to some extent, suffers the same perception. But I wish you well with your new opportunities, though it sounds like they do not all relate to using methanol as transport fuel. It might help if we could agree on what standards a fuel has to meet before we get started. Let’s set an energy density bar, and then see how many fuels can leap over it. This is the wrong standard. The volumetric, or even mass energy density, is not really critical (except for aircraft). No fuels can match oil for energy density, so any bar has to be set lower, but how much lower? We now have BEV’s hitting the road that use an energy density of 1/100th that of gasoline – is that low enough? Compared to that, what is the problem with 70% energy density for ethanol, 50% for methanol? The first standard is safety – if the fuel is too difficult for normal (i.e. not trained or certified)people to handle safely, it is not safe. Hydrogen is at the bottom of this list, LNG/CNG next, and then almost all liquid fuels can be lumped together above this, though there are minor variations between them. The second standard is environmental protection. The fuel should have minimal/controllable impact if spilled. Alcohols have minimal impact, oil some, and things like benzene and MTBE have severe impacts. It should also have acceptable methods of production. Corn ethanol would seem to be acceptable, razing rainforests for palm oil, not – although it is still happening. It should produce clean exhaust, to the standards of the day. A good start here would be a change to EPA requirements to allow any engine to use any fuel, as long as it meets the emission rules – currently, modifications are not allowed, whether it meets the rules or not. Beyond that, it really comes down to economics, and acceptability/convenience, and that is up to the various alternatives to work out for themselves. We should be careful in setting “standards” here, as they tend to favour some technologies over others, and exclude new innovatiuns..
What really counts at this point, having satisfied safety and environmental concerns, is what works, what is affordable, and what people will actually use – and it does not mean there has to be only one answer. some fuels, like butanol, trade affordability for convenience – it can be mixed into gasoline in any quantity, requires no engine or fuel storage/supply changes, so is very convenient, but just very expensive (and not energy efficient to produce). EV’s are the polar opposite – very cheap “fuel”, but expensive equipment, and different fueling infrastructure. There is space out there for more than one solution. A $1.00 per gallon wonder fuel is useless if it takes a million dollar motor to burn it. That would be the hydrogen fuel cell. Methanol, hydrogen, and CNG are not going to make it the US alternative energy market. If you are an advocate of those technologies, I would suggest that you find the root cause of past failures rather than beat down ethanol. Quite true. Gasoline is the fuel of choice because people wanted to use it, as it became the best choice. To be truly successful, the alternatives must prove themselves a better choice still, based not just on technical grounds, but customer acceptance. In this regard, none have been successful, not even ethanol (i.e. the low uptake of E85). E10 has worked because you can’t tell the difference, and E+M10 would work equally as well, as would minor blends of any alcohols. But to go more than that, to completely replace gasoline as the fuel, for anything other than special cases, is a herculean task, verging ion impossible dream. And to date, nothing, not even ethanol or BEV’s, is showing the ability to do that. The all purpose vehicle is the toughest target simply because oil is, and remains, the all purpose fuel. For that reason I favour looking for the niches where the alternatives can work better than oil, and develop those markets. They may or may not develop into something larger, but if an alternate fuel can have a successful niche market, that is much better than an unsuccessful large market. “The first standard is safety …. This can not be stated too often. Renewable energy sources are no exempt because of a perceived environmental benefit. AGW is a concern of many but sending workers home at night to their families comes before protecting the environment. What I hate reading about is children being killed by parents worried about wasting energy. Energy is supposed to improve our lives not destroy it. Those niches that Paul talks about usually include industrial safety professionals. After a few years of experience, alternatives might be ready for the wider market. It is a risk/benefit thing. Radioactive isotopes are used to power pacemakers but I would recommend using spent fuel for house heating. While entirely practical, the cost of doing it safely would be enormous. The most important criteria for energy is having when a where you need it. Keep the combustion in the ICE and the radioactive material inside the nuke plant. What really counts at this point, having satisfied safety and environmental concerns, is what works, what is affordable, and what people will actually use – and it does not mean there has to be only one answer. Personally, I’d place hydrogen near the top of the list for safety. The average person doesn’t have to be trained to use it. Doesn’t have to even sniff it. Just lock the little doomahickey when fueling up, and you’re good to go. Yes, it can be explosive, but so can gasoline. That’s why engineers work so hard to keep fuel tanks from exploding in a collision. On environmental concerns, nothing even comes close to hydrogen. Don’t even bother with a list. Which fuel uses the least energy overall? Once again, hydrogen tops the list. Nothing uses less total energy than H2 from renewable energy. The EV is a close second, followed by H2 from natural gas. Which uses the least fossil fuels overall? Remember, this is the ultimate goal we’re stretching so hard to reach. You guessed it, FCV with renewable H2 uses none. Zero. Zilch. A FCV running on cellulosic ethanol is a close runner-up. We can use a dozen different fuels, each running in a different motor. We can even reconfigure the ICE each time we run through our fossil or biofuel of choice. OR, we can recognise that each and every one of those alternatives have one ingredient in common. AND, we have a way to burn that common ingredient in a highly efficient manner. 200% more efficiently than the ICE or any of its reconfigured iterations. Here’s where I got all those nifty comparisons. 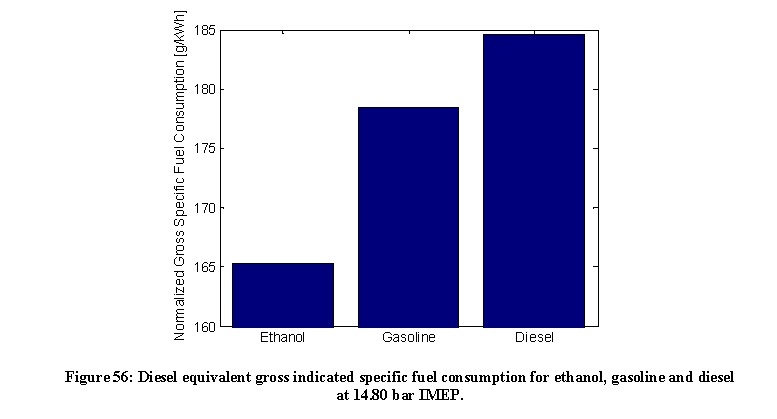 One of the major knocks on ethanol is energy density. Yet, some of the same folks who loathe ethanol, love methanol, a fuel with less density. If you directed that at me, you are wrong. I have no problem with the fuel properties of ethanol. My particular beef is with corn ethanol, and specifically with Corn Belt politics; the lobbying; and the backroom shenanigans that gave corn ethanol momentum it didn’t deserve had the decision been based purely on market forces and the Laws of Thermodynamics. The primary motivation behind corn ethanol has always been to increase the corn commodity market for the farm states — it’s properties as a fuel have no correlation to the politics of corn ethanol. I was delighted yesterday to read Al Gore’s statement saying he finally realized corn ethanol was nothing more than a political animal, confirming what I’ve felt to be the case for several years. Al’s statement must be sending the National Corn Grower’s Association and the corn ethanol alphabet groups (RFA, GE, et al) into a tizzy. 3) Biomass in the form of the waste with which we fill our landfills or let rot in our fields and forests. * If it were a question of fuel properties alone, the alcohol of choice would be butanol. If you directed that at me, you are wrong. I have no problem with the fuel properties of ethanol. On second read, you’re right Wendell. What I mistook as an aside against ethanol, was in fact a commentary on those shifty purveyors of fuel. Dont forget urea as a solid form of hydrogen.. and it is widely manufactured today. Here is a method using electrolysis: http://www.greencarcongress.com/2009/07/urea-20090703.html or you can just heat urea to about 200C (I think) and it decomposes. Of course using urea to power transportation would affect the cost of food. A true statement, but not a diatribe against the properties of ethanol as a fuel. Fuels should sold by their energy content instead of by volume. I’ve long been a proponent of selling liquid fuels in units of 100,000 Btu. The volume is irrelevant — whether ethanol, methanol, gasoline, or diesel. Many are impressed by the fuel mileage of diesels. Some of that is because diesel engines are more efficient, but some is also because a gallon of diesel contains more energy than a gallon of gasoline. People rarely consider the higher energy density of diesel fuel when bragging about the mileage of their diesel-powered cars. We should also not be messing around with volume equivalents when computing the efficiency of an electric car. Electrical energy is most often measured in kilowatt-hours, and we should learn to think in terms of miles/kWh for electric cars. requirement from the Secretary of Transportation. This would at least give us an option at the pump, and unlock the barriers in place by the auto companies and EPA on emissions. Would this be an acceptable first step to alternative fuels? Giving the consumer an option? significant,” writes Exxon exec Ken Cohen on the company’s “Perspectives” blog. Is there an opinion that RR has written on the legislation in support or against? Electrical energy is most often measured in kilowatt-hours, and we should learn to think in terms of miles/kWh for electric cars. I like btu/mile Wendell. It allows easy comparison of all manner of vehicle and fuel types. Some fuels look good at first blush, but really stink after the final analysis. For instance, cellulosic ethanol H2 does great in fossil btu/mile. 1200 btu/mile vs. 6000 for a gas ICE. But, if you look at total energy use, it’s a hog at the trough. 8000 btu/mile. That energy will go a lot further when used in some other manner. The hands down, across the board winner, is definately wind H2. Zero emissions. Zero fossil btu/mile. And, also the clear winner in total energy btu/mile. Nat gas H2 also does surprisingly well in all categories. provided? If new legeisaltion addresses that, than yes. and nobody said it would be easy. about 70% fossil with very little of that coming from oil . doing that please start with ‘once upon time I like’. compare a fantasy world to the real world. Guilty as charged Kit. I dream about a better way for our children and grandchildren. A clean, sustainable, way for them to have our comfort level, without the energy insecurities. The next generation deserves better than old Corollas running on E10. And, they shouldn’t be tethered to little boxes with big batteries. We can do better than that. Did you ever think about going back to college so you would actually have the skills to do more than dream Perry? The problem I have with those who dream about a better world is that they do not look around at how good things are. The presumption on Perry’s part is that his way is better. Have you ever considered not fear mongering. Most insecurities are a result of irrational fear. Provide energy to meet our needs is not a problem I am worried about because there is a systematic approach to solving those problems. No, the next generation deserves whatever it earns. I do not see anything wrong with Corollas running on E10 it meets the needs of my wife and I. My first car was rusted out 60’ Ford Falocn with no smog control running on leaded gas. We had a coal plant down town and it snowed grey. Time was a 5 year old car was a piece of junk. My son’s each drive a ’93 Camry. It meets their needs. Interesting thing about progress, back when the US was I had that minimum rage job I and gas was 25 cents a gallon, I could drive just as far as on an hour’s wage as kids today with cleaner more efficient cars. I see a very positive trend over my life. Our living standards get higher every years and the energy required to do that and environmental impact is gets smaller every year. Now Perry if your self worth depends on a very big but efficient tow vehicle to pull your boat while being sustainable with wind power, you are on your own. I’m a little busy putting my kids through college Kit. My daughter graduated last year, and my son starts LSU next year. He plans to major in chemical engineering, so he can get into fuel cell technology. His plans, not something I put into his head. He’ll be housing with three nerdy friends who also plan to be engineers of one variety or another. These youngsters are excited about the future. I don’t think they envision a future of charging their transportation more often than they drive it. As far as how good things are, someone’s been hitting the crack pipe. Every time you fill that Corolla with E10, you’re sending a dollar to thugs who want our heads on a platter. Then, we spend another dollar to keep the barbarians outside the gates. That’s no future Kit. Not my self worth Kit. My net worth. I depend on that full-sized pickup to pay my bills. I don’t have a boat, and never have. But, I could pull one if I chose to. Try that with a Corolla or plug-in car. EV’s are a step in the right direction. I won’t argue with that. But, they aren’t a solution. Biofuels also help. But, they’ll never provide the amount of energy we need. Fuel cell prices are dropping like a rock. A fuel stack already costs less than a li-on battery. It will be half the price in a few short years. Which would you rather replace after 10 years/100,000 miles, a $6000 battery, or a $3000 fuel cell? If you answered the one you’ll spend 8 hours a day charging, you’ve been hitting that crack pipe again. No, the next generation deserves whatever it earns. The problem I have is that the next generation is going to carry a lot of baggage from the current generation. They are going to have to earn their share and pay for a chunk of ours. Not really. We don’t ever pay off those bonds; we just roll’em over, and let inflation take care of it. Always have; always will. The real question on the ethanol subsidies is: Do we want to pay another $0.04 for gasoline now, or do we want to borrow that $0.04 from China, and never pay it back? Ridge Parkways than rivers that catch on fire. know when you drive a 20+ year old BEV or FCV to work everyday. That’s a very interesting approach, which, really, should then be scaled up to the current $3/gal, and then ask the same question – the answer will be just as valid/invalid. Maybe that could be offered at the point of sale – you have “pay at the pump” and “borrow at the pump”. Do you mean like the cost of WWI, and then their was that damn FDR and social security? No, that’s not what I mean at all. You are 180 degrees of the mark. I mean borrowing money so we can pay for subsidies on things that are already mandated. No relation to WWI or programs that actually benefited U.S. citizens. The redundant subsidy does not do that. My only quibble is I do not believe for one moment our children will be paying for this debt. It will be inflated away or defaulted on long before it came to that. Maybe true, but the fuel for your ICE is not going to be there forever, so what good is having a car with no fuel to run it? I will be the first to admit, I would love to be driving my ICE in 20+ years, but looking at oil production, I come to the conclusion that is very unlikely. So, I embrace electric, which to me is the next best thing. While a BEV/PHEV, what have you, may not be as ‘nice’ as an ICE, it is still far better than walking everywhere. YMMV. it is still far better than walking everywhere. The ICE will still be around in 20yrs, but it won’t have the roads to itself. It will be interesting to see what ethanol is doing in 20yrs – hopefully it will not still be being subsidised then! @ Walt – I notice in the the legislation that you quote it says E85 and M85 – the M85 capability would seem to be a very well kept secret, but there is your market opening. While some are predicting the imminent demise of the ICE, those that make, and fuel them, are working hard to improve them. Thanks to Rufus we all know about the flex fuel Buick, which is an example of an ethanol optimised engine. But moves are afoot to get much more efficient engines. Below is a graph of fuel consumption results from engine testing by a bunch of Swedish researchers – in a project funded by Chevron! They used a modified Scania truck diesel engine, with a two stage fuel injection process. The first injection happens about 60deg before TDC, with about half the fuel, and the second is near TDC, to ignite the mixture. This graph is based on the btu value of diesel, and ethanol at 165g/kWh equates to almost 50% thermal efficiency – normally the preserve of large marine diesels! Most commercial diesels used in trucks, tractors etc get 220g/kWh at max efficiency, and world record is about 155 for a house sized marine engine. It also had much lower particulate emissions than diesel, and met standards for NOx, CO etc. Full details are in a PhD thesis here – data overload, but interesting stuff. The fact that they could take an off the shelf engine, fiddle the fuel injection, and inject all three of the most common liquid fuels, and get efficiency that normally belongs to massive marine engines, is quite amazing. They were also able to use cheap, low octane gasoline (down to 70) and still get good results – no wonder Chevron are interested! The ICE may be losing its monopoly, but it will still be around for some time. Interesting Paul. Those reasearchers do amazing stuff. These guys claim to have invented a perpetual motion desalination machine. That could come in handy too. Paul, I would agree. The issue really is who is going to put their neck out there and openly discuss the issue. I think the silence is clear from RR that he is not going to touch the methanol issue again after the heat he got from the first two articles. You can see that Exxon is openly opposed to blending ethanol above 10% and so clearly methanol is out of the question as a fuel blend stock for flex fuel cars. The refineries are not going to touch it unless methanol meets their renewable mandates, and that is unlikely unless Range Fuels can grab the market share, and turn those skeptics from their producing methanol running for cover. I know they need higher value fuels/chemicals with their process…like ethanol…to make money, but it might be interesting if they took that methanol and could put it in the fuel supply chain as a renewable based fuel for refineries. The link I provided shows there are less than a handful of bloggers out there willing to put their reputation out there on methanol and take the heat from the ethanol lobby as well as other critics of methanol as a fuel blend or chemical feedstock. In my due diligence, I can see the discussion is going to be framed around only “national security”, phase III, and when that happens politicians do things that few benefit…and it generally is not the public. The average American is getting about as tired of Washington as what people say in the last almost 40 countries I’ve traveled. I suspect when the criticism inside America reaches the same level as that outside America against Washington politics, we might see “real change we can believe in” or whatever was the slogan that got eveyone all warm and fuzzy, weeping and crying in the streets around the globe. Methanol should be part of that change and be at the table…but if it is all focused on national security rationale we should allow some new technologies to be considered like Range Fuels, and other methanol vendors who deserve lobby support like ethanol and gasoline. It makes sense why the Methanol Institute does not have much power being foreign controlled…that is never an easy line to walk in Washington politics to have a foreign controlled lobby association seeking policy. I cannot believe it took me this long to get a grip on where this is headed…in theory. Fortunately for us, natural gas is very cheap here and even if one cannot pay for a GTL plant in 18-36 months like Pearl, we definitely will move from the garage to the field next year. I hope I can put 10 mini-plants in the field next year and demonstrate 40 foot containers make money with cheap or free natural gas. The SEC and accounting question is the biggest question right now. Like the VC guys who financially engineer everything to work even if the deal goes bad…the question has to be how to change reserves value when defining “economically producible” under SEC regulations 210.4-10(a)(22)(v) and (26). To make it attractive to producers, you have to double their book value, or make it so their stock price has an effect. In the oil industry during the last 20 years I’ve been involved it is even more important to show people limited risk, high returns and government permission…so it might be there in the SEC regs. You can see that Exxon is openly opposed to blending ethanol above 10% and so clearly methanol is out of the question as a fuel blend stock for flex fuel cars. That’s the problem in a nutshell Walt. It’s never going to be used in concentrations higher than 3%. Manufacturers flat out refuse to warranty engines using higher concentrations. 3% worked fine as an oxegenate until it started contaminating water supplies. People dependent on well water are not happy when their water gets fouled. Lots of issues with methanol. Mobil invented a way to turn methanol into gasoline 40 years ago. I’m sure those patent rights have expired. It probably isn’t being done because it would take too many gallons of methanol to make a gallon of gas. I’m not entirely sure that 3% are the max allowed. I have been told by a Grand Rapids ethanol producer that since the late 1980′s all manufacturers did upgrade their engines to accomodate ethanol/methanol wear and gasket failures. From what I understand, the auto’s can support both methanol and ethanol currently in most cars in terms of engine gasket failure, but the issue is with engine performance. This means with $200 per auto the car could be made to handle up to 85% methanol, ethanol, etc. without voiding any warranties whatsoever. Are you saying the engines cannot handle methanol/ethanol above 3% and thereby void the warranties, or that the auto companies will not permit anyone to modify their own engine to run on E85 or M85? I have no idea about methanol contaminating water supplies. I own a water company that supplies water to residential users and have never seen any issues about methanol contaminating water supplies. The issue I’m familiar with was MTBE contaminating water supplies, but as the law suit pointed out between Methanex and ADM it was largely blown out of proportion…and was a political play by ADM to pay Gray Davis lobbyists to write and put through legislation which rippled through multiple states to save Americans from evil MTBE producers. I don’t think they have banned MTBE in other countries from what I know, and in fact the last refinery conference I was at several weeks ago, sees it is growing outside the USA for blending. Nevertheless, like everything to do with national security or health emergencies, I need a second opinion. Once you start traveling the world it seems to be a lot different than college text books in history class, and most people want access to the tools to make informed decisions. If you can get me information on the 3% methanol water contimination problems I would like to have the information. We have had residents ask about water sample tests that would show other drug company contaminants in the water supply, and other issues the public has a right to know, but if you have something on ground water contamination (besides anything funded by ADM) using methanol, it would be welcome. I can see why the oil co’s don’t want to go there – they are making a killing now, and there are complaints from some people about ethanol in the fuel, so why take even the risk of adverse publicity with methanol? The opponents will cite all the negative info, etc etc, and the politcians are unlikely to ever give you a mandate. If you are looking for a national mandate for methanol in fuel you will die trying. If you want a successful business for your biogas to methanol conversion process, that can be achieved – you just need to find customers that want to use your methanol. I should point out, if you aren’t aware, that some sewage treatment plants use methanol as part of the treatment process (over 100 of them, according to the methanol institute). they add it in the final stage of treatment, and bacteria use methanol as food, and dissolved nitrate as their oxygen source, turning it to N2 – that is (one way) to remove nitrates before discharge to a river or sensitive receiving water. Find an STP that is using methanol and also doing AD on their sludge and you have a customer! Methanol, and any other alternative fuel, has to earn its place in the market – ethanol got a huge boost from the mandate and subsidy, that will not be repeated – nor should it be. I think the silence is clear from RR that he is not going to touch the methanol issue again after the heat he got from the first two articles. I think I said what needed to be said about methanol. We can clearly produce large amounts of methanol at a price cost-competitive with gasoline, because we do it today and it doesn’t even require subsidies to do so. Therefore, I think methanol makes a very good technical solution. But other barriers will have to be broken down. I think the oil companies, for one, would be all over it if methanol produced from natural gas was treated the same way as ethanol produced from corn (via natural gas). I still think methanol’s time will come, but it simply has not had the same legislative advantages as ethanol. But when you start looking around and saying “What could really compete with gasoline down the line?”, methanol will factor into that I believe. Happy Thanksgiving, all. Today is my favorite holiday of the year. Family, food, and football. You can’t beat that. with a more advanced program. That was several years ago too. The standard response to a college professors cliams should be ‘when pigs fly doc’. Toyota said many months ago that they will produce next generation secondary batteries for improved PHEV/BEV. They will probably do it by 2015 or shortly (a few years) thereafter. Larger USA style heavy cars and specially 4 x 4 type light trucks that we like so much are good candidates for PHEV technology, at least until such time as e-storage units energy density has improved (3x+) and cost is down to 1/3 current Leaf level of $375/Kwh. That may not happen much before 2020/2025. Interesting decade ahead Of course, much improved ICE vehicles will resist being phased out and willco-exist with PHEVs and BEVs for another 20+ years. I recall one report that did reach viability. A researcher at MIT patented a new lithium battery chemistry that used nano-phosphate technology which would create a more stable chemistry and allow large current draws. Big whoop I thought. Call me when I can buy one of these batteries. A few years later I bought four of them and still power my bike with them four years later. Robert, I was not thinking about whether you liked methanol or not…as I think your two past posts error on the positive side in light of the stir it caused by the biofuels community and others openly (in the comments section) negative on methanol. Rather, I was thinking how you view the government mandating the auto companies to deliver more flex fuels cars to create the demands by the consumer for alternative fuels. This would clearly be a government mandate as those pieces of legislation require, and would not be a voluntary recommendation. If those mandates were met, cars could operate on M85 and E85. I believe this is the first step…not so much toward national security as the lobby groups are now surfacing to revisit the Open Fuel Standard Act, but in giving consumers a choice in fuel…even if they are not at the pumps today. For me it is a start even if Methanex and the four other major producers (we are now over 90% imports) will hold greater control over that market too…it could be temporary in my view of consumer demand for M85 at the pump caused more competition…unlike the market today. It would be like having four oil producers outside the USA that supplied all the crude exclusively (go from 60% to 90%) to America. That would make people nervous. Enjoy your favorite day. It is a blessing few should forget. 99.9 percent of them do not result in commercial viabity. There are “tuner chips” you can buy today for many vehicles that can optimise for power or fuel efficiency ( but not both at once). The carmakers are well aware of this too, but have to set their engines to work over a very wide range of driving conditions, so are forced to pick a middle point. But engines like those in the Prius and now the Volt can operate in a narrower load range, so can be more optimised. We are now seeing more the dual/triple mode cars, that have an “economy” mode, where the engine management optimises for fuel economy, so things are moving in this direction, but I see this two stage injection as being a way to make a substantial jump in efficiency, and load control. The “drawback” to the engine configuration they tested, is that the power density is lower, because they run high EGR and a lean mix – exactly what the winning X-prize car did. But, low power density, and high efficiency, is exactly what you want for cruise state, and if you need to go back to conventional single stage for rich mixture and max power on acceleration, then control system can do that, but the rest of the time, it is lean and low emissions – exactly what we want. Interestingly, this engine configuration can also be run on kerosene/jet fuel – something the military are quite interested in. But Russ, you are right, some things we don;t think will make it, do. The great British mathematician and computer pioneer, Alan Turing, in the early 50′s said, ”I cannot see that the needs of Britain would ever be more than five computers” ! No, actually, I was hoping for some support for the Open Fuel Standard Act which would create a mandate for the autos to give us a better choice in the matter on fuel options. Then, I would try to push the EPA to let us modify our own cars with the E85 and M85 kits being sold on eBay that are legal for everyone…except when EPA threatens people with emissions penalty. Ethanol and Methanol both burn cleaner than diesel and gasoline, so why restrict their use because emissions testing will not approve them? At least the Open Fuel Standard Act would cover these emissions approval, and allow customers more freedom to buy cheaper fuel. I could see M85 selling in my area for $2.00 per gallon, or less. Remember my comparison to the M85 numbers that the Methanol Institute published this year to support Methanex (the Chairman). One problem you’re facing, is that methanol is a lot like Hydrogen Walt. It’s an energy storage method. You always end up with less energy than you started with. Like hydrogen, it has many other technical obstacles. That doesn’t mean it won’t be the fuel of the future. A lot of people think it will. My own opinion is that hydrogen wins, but methanol wins too. The cheapest way to make hydrogen on site is through steam reformation of nat gas. For sites without nat gas infrastructure, and there are many, methanol reformation is cheapest. The biggest challenge with hydrogen is transportation and storage. On site production gets around that. These guys think methanol might be the energy store of choice. No, actually, I was hoping for some support for the Open Fuel Standard Act which would create a mandate for the autos to give us a better choice in the matter on fuel options. Fair enough. Not that my support counts for much, but I like the way your excerpts read. We will have flex fuel capacble vehicles, so people have the choice to use other fuels, but are not forced to. I would like to see the exemption from CAFE rules for flex fuels dropped though, as they definitely game that system, by only making large vehicles flax fuel, where they get the greatest credits. That is of no help to a small car buyer. Equally important is the relaxing of the draconian rules on modifying cars. If you are going to modify a car or its fuel, and it can pass a proper emissions test,(each year) then you should be able to use it – that encourages innovation, and allows for the improvement of existing vehicles to use new fuels. That, of course, is exactly why the automakers don’t wan’t it – they want the Kits of the world to get rid of their old but functional vehicles and buy new ones. If the older vehicles can be made compliant then great. If they are grossly non compliant (the smoke belchers) then they should be off the road. The current position that you can be prosecuted for using a higher blend than than E10/E15, and meet emissions standards, but be prosecuted for using a “non approved fuel” is silly, and, in my opinion, quite a barrier to innovation. Remove that rule. set clear rules on what standards must be achieved for existign vehicles to run on any blend of G, M and E, and then let the innovators meet them. It will spawn a lot of small business/aftermarket activity – and that would be a good thing right now. One problem you’re facing, is that methanol is a lot like Hydrogen Walt. It’s an energy storage method. Other than solar*, nuclear, tidal, and geothermal, what fuel is not just an “energy storage method?” Even wind and hydro energy are results of the Sun; and coal, oil, and biomass are all stored sunshine. * Which is really just a huge nuclear reaction. My first patents were filed in 2004 with the a scientist that can hold a candle easily to George Olah. He was not a Nobel chemistry laureate, but he was consider the founder of chemical kinetics, was the head of the world’s most advanced hydrocarbon oxidation institute, and has over 430 articles published on the direct partial oxidation of methane-to-methanol. My subsequent patents brought in who I believe is America’s foremost authority on the kinetics and when Dr. Nonomura joined our small company I can say we are able to compete with more lab data than Exxon, Total and Dow (the three who hold the most reaction data sets in my opinion). Yes, I know others have researched it, but the definition of “research” within these large companies do not impress me…I’ve had too many of them in discussions over the phone or in person only to realize they really have no idea what they are talking about as “experts” in chemical kinetics. However, I say this lightly as I’m not a chemist even though I have spoke with many. The way Olah raised his money on his first patent in CO2-to-methanol sort of blew me away. It was done outside the United States, and I think with some really serious people behind him. The entire methanol push coming back to America I really believe is because of his efforts. He has a lot of very great respect in the community, and with his book it got people thinking. I watch his patents often as they publish and he is doing an amazing job, but he has some really strong funding…and now he has the lobby efforts where the core is “national security”. This could be the game changer as they say to bring methanol to the surface over the hydrogen economy, and the ethanol economy. Now you tell me that is not the who’s who in the world of scientific research…can you find a more impressive “dream team” of Universities being given millions to find the solution to the problem. Well, if you file one grant after another (as I’ve done) and you get denied over and over because of the most stupid, unintelligable reasons…and even the Methanol Institute does not promote your technology…something does not add up. But, I think things are about to change… I can say watch Exxon, Total, Dow and KBR Technologies… You can watch us too, but we won’t make any bit press releases like those companies I’ve mentioned…and the Universities from the “Dream Team”. Oh, watch Olah…with the national security push now in Phase III watch a lot of money going toward CO2-to-Methanol. Just guessing and speculating. We need competition in the sector so I’m in favor of let the best team move forward…but at least lets spread some of the money around so we all get a fair chance to make a difference in alternative fuels! and coal, oil, and biomass are all stored sunshine. Natural gas as well. But, when we convert from one usable fuel to another, the second is referred to as an energy store. That’s why gasoline is known as an energy store, and oil isn’t. Energy stores( the sunshine stores excluded) can’t be found and used naturally. At least none that I can think of. That includes electricity, gasoline, methanol, hydrogen, and others. The same “second law of thermodynamics” applies to all energy stores. If oil wasn’t such a good multitasker, we’d probably use it straight up in our cars. BioMCN is the largest second generation biofuels producer in the world. twice in accordance with the Renewable Energy Directive. and fuel additives (e.g. MTBE), and also as a fuel in its own right. Converting methanol into gasoline increases the cost by about 10%. This, however, doesn’t include the capital cost of building a MTG (methanol to gasoline) plant in the first place. But New Zealand used the MTG process to produce 600,000 tonnes of gasoline from methanol per year way back in the 1980s. That’s why gasoline is known as an energy store, and oil isn’t. Pshaw! Oil is nothing more than biomass that grew because of solar energy. Oil is also an energy store — stored solar energy from millions of years ago, as is coal but from a different type of biomass. In fact, oil and coal are the original biomass fuels. The only sources of Ur-energy I can think of are solar (nuclear), nuclear (fission and fusion), tidal (gravity), and geothermal (the nuclear reactions deep inside the earth). It looks like without nuclear reactions we would be screwed doesn’t it? Energy stores can’t be found and used naturally. At least none that I can think of. What are you talking about? We use natural gas directly in the form we find it. We also use coal directly in the form we find it. When I was small, we had a coal furnace, and my Dad would have to carefully bank the fire every night before we went to bed. Converting methanol into gasoline increases the cost by about 10%. What is the advantage of converting methanol to gasoline instead of just using the methanol directly as a fuel? The only one I can see is that the logistics might be a bit simpler (no need to duplicate transportation and storage systems) but is that worth the losses of converting methanol to gasoline? What is the advantage of converting methanol to gasoline instead of just using the methanol directly as a fuel? What’s the advantage of converting natural gas to hydrogen, then methanol, instead of just using the natural gas or hydrogen directly as a fuel? Perry, I can’t believe you are being sincere in asking this question. The advantage is, of course, that methanol is a liquid, that stores at atmospheric pressure and ambient temperature. Neither hydrogen nor NG can do this, so that is huge handling and storage advantage for methanol. Anything involving pressure vessels = cost + space +weight, and none of those three are desirable for transport fuels. The advantage of converting methanol to gasoline is simply to turn it into a freely traded commodity fuel, whereas methanol remains an industrial chemical. They closed that NZ plant in the 80′s, (went back to just producing methanol) as they couldn’t compete with $10/bbl oil. It might be a different story today, or tomorrow, but as Walt points out, there are significant political barriers to methanol being a widespread fuel. But a country like NZ might just be tempted to go there – when you import oil but make methanol, the situation is different! Perry, I can’t believe you are being sincere in asking this question. It was a rhetorical question Paul. The reason any product is made, is because there’s a demand for it. As you said, the market is there for gasoline. When methanol to gasoline becomes cost competitive, it will get done. Given that methanol to gasoline is just an alternate GtL scheme, the question has to be asked if it is better than the F-T system used by Shell. And the fact that the Mobil process is not being used anywhere in the world, suggests it is not. The F-T process has the advantage of producing high quality petrochemicals, while the Mobil process transforms one commodity product into another. But, if NG stays as cheap as it is in north America, and oil keeps going up, it is only a matter of time before some type of GtL process is started, somewhere. It is, of course, better (more energy efficient) to burn the NG directly as transport fuel, but it will likely be more profitable to convert it to liquid fuels, so that is what will get done first. Paul, a few points. I’m not going to be able to comment much anymore as next week I need to try to stay in the shop testing. This list is missing the understanding of technology innovation economic advantages over economy of scale advantages. I’m not going to discuss it here since this blog is more and more focused on ethanol issues, and for me I don’t want to get bogged down as an ethanol critic. I’ve learned a lot here over the past few months on the issue, and have appreciated the indepth discussion from RR and especially your commentaries. Let me just say that direct conversion of methane to methanol is 70% cheaper in capital cost than using traditional syngas route with hydrogen (e.g., Perry comment above). I don’t think people here understand the benefits of even a 10% reduction in CAPEX with economies of scale factors. In our GTL Conference in London a Russian company claimed a 10% reduction in producing Syngas from Natural Gas and the audience went crazy with questions and everyone wanted to know how it was possible. It was highly technical, and beyond my expertise (as I am not a syngas expert), but without reducing the cost of the front-end syngas piece these FT processes go nowhere. Just take my word on this known fact. GTL technologies need to reduce sygas CAPEX or “eliminate” them from the equation. As much criticism as methanol gets in the marketplace…I really believe in the past couple weeks something is going on behind closed doors. I know pretty much what is being developed that is publicly released and have some insiders who share with me some companies who gather our information for their own developments. I also know what super majors I have disclosed a lot of information too over the past 4 years, and how the system works to gather, let NDA’s expire, and watch employees work to build a name for themselves rather than cooperate. I suspect I was a little bit naive dealing with these bigger companies, but I gave you the list to watch above. Finally, read these two posts (the first one came within 90 days of all our disclosures personally to Dow here in my office) and the second 1 year later. It validates us nicely since it makes clear out of 100 proposals they received direct methane-to-methanol is really the only way. I’m not sure if people still get the point, but let’s get back to the ethanol topics at hand and see what surfaces next year with methanol. I really wish someone would do a blog on the Open Fuel Standard Act that has a broader following that the “national security” agenda. I really believe that if there was a consumer option for fuels, I might find someone open to supporting our develop who is serious in doing business…not just gathering our data and working around our patents. It is so much easier to just do business…as all methanol fuels don’t have to be in China. Let me make one final point. As everyone on this list knows, both Khosla Ventures and Kleiner Perkins are the VC firms which have the golden touch when it comes to funding the “next BIG thing” as Kleiner’s website says. If you get funding from these two firms you have “made it” in the clean tech space. I cannot count the number of times I’ve sat in meetings with potential customers or smaller investors who asked, “Did Khosla look at this and why did they not invest?” Similar things happen with Kleiner. The point is…you are nobody in clean tech fuels and chemicals unless you have been courted and funded by one or both of these VC firms from my observations the past 4-5 years. Let me make the point that I think people are overlooking above about removing the syngas step. This is the response from Khosla Ventures who had one of their so-called “Monday meeting” to determine who in the clean tech space will be put up in lights and the media. are included. Thanks for passing along the opportunity and best wishes in building your business. Do you see that they think O2 plant is going to be a CAPEX problem for a technology that is reducing 70% of the syngas step? Do you know that you need an O2 plant for making syngas typically…unless you are like Syntroleum, etc. using air? It is a non-issue to have O2 costs when you remove 70% of the front-end on traditional methanol or GTL processes. However, if you don’t pass the muster with the VC experts in the valley it can cause more harm than anything in fund raising. When Khosla’s monday meeting got concerned with our “valuation” and the O2 costs we realized people don’t understand what CAPEX reduction means. Perhaps they had other issues with the technology as well…just like Dow did above until they received 100 proposals for direct conversion…and decide that direct methane-to-methanol was the only solution. I won’t share Kleiners response to me as when I got their message I wanted nothing to do with VC mentality to take steal something of value, or ignore the facts. Needless to say we agreed to frame Khosla Ventures comments and put it on the wall so people can see before they ask the question. The whole world does not revolve around the valley VC community where I come from, but when it comes to clean tech or green tech fuels everything has to pass their litmus test to be taken serious. Well, it is certain we will never get money from Khosla or Kleiner, but I want you to see even if our technology is not proven to scale, or will not operate as nicely as we anticipate, I can say it had NOTHING to do with O2 costs or even our valuation. I’ve spent tens and hundreds of millions of dollar less on our technology than what gets thrown into my competitors by those experts. Let’s be fair…even though the investment community all guage credibility by mostly those two firms in clean tech…I will beg to differ. But, the proof will be in whether I can do it using the old bootstrapping approach. If not, I will take down the frame and take the criticism happily. I’m all for using natural gas directly as fuel, although there are few cars that can do it — the exception being Honda’s Civic GX — and not a lot of infrastructure fill refueling, although a high percentage of homes on the U.S. already have natural gas lines into them. Honda only sells the GX in California, Utah, Oklahoma, and New York. There is also a unit available called Phil that people can attach to their home natural gas line and use to refuel the GX. I’d like to see other car makers sell a natural gas powered car, and their use become more widespread. That would certainly be an improvement over using natural gas to make synthetic nitrogen fertilizer, then use that to grow corn, and then use more natural gas to distill the fermented corn mash. We’ve already discussed the problems and dangers of handling hydrogen both in gaseous and liquid form. I won’t repeat those since they are far off topic for this thread. Making a liquid fuel from the hydrogen offers convenience, portability, and ease of handling. And in fact, a liter of methanol carries more energy than a liter of hydrogen. Comparing fuel methanol to gasoline made from methanol is six of one, half a dozen of another. I don’t see the advantage to incurring the losses of the transformation from one liquid fuel to another. I truly hope that you can make your process commercial, because it sounds like that is the only way you can prove the naysayers wrong. Don’t waste your time with Khosla etc. Their business is leveraging government money from their VC efforts, none of which have become successful, stand alone businesses. If you can achieve your capex reductions on small scale production, you do not need 100′s of millions of VC, and are better off without these vultures. Edison did it his own way, and most disruptive technologies have. Keep in mind the NG industry is composed of many small scale produces (i.e. wells) – if you have something that can go down to that scale, then you have something no one else has. Clearly one issue is what to then do with your methanol, as it won;t be a mainstream fuel for some time, but I still think it can be a niche fuel. Can methanol be mixed with, and separated from crude oil, like NG liquids? Maybe it’s time to discuss the dangers of handling methanol Wendell. 1/3 of an ounce can cause permanent blindness. 3 ounces will kill you. It’s not something you’d want to siphon from your tank. It’s just as toxic if you get it on your skin. That doesn’t mean we couldn’t use it on a wide scale. It’s easy to transport and store. It can be shipped to gas stations and reformed into hydrogen by professionals onsite. Yes, hydrogen has obstacles to overcome. But, carmakers are demonstrating that those obstacles can be overcome. Nothing is cleaner or more efficient than hydrogen. Nothing can do more to wean us off oil. That’s why so many people continue to push forward with it, when the idea is popular, and when it’s not. Perry, there is a difference in safety of handling, and the toxicity of the product. High pressure steam or compressed air are not “toxic” (in a chemical sense) but they sure are dangerous to handle. Methanol is safe enough to be sold at the hardware store – gasoline is not. Methanol is easy to reform into hydrogen, at the point of use, if hydrogen is what you want. The discussion for cars is a bit academic, when hydrogen has yet to make any real inroads into industrial niche markets – e.g trains, forklifts, fleet vehicles. And it is not even the cost of hydrogen, it is the fuel cells and the storage and handling equipment that are the hurdles. Progress on H fuel cells is slow, and there are no real alternatives to the storage issue. You have added layers of expense and complexity for a clean fuel, that you would not need if you were happy to just use the methanol intermediate. Plug Power have had H2 fuel cells for forklifts on the market for five years, and they are struggling. If you look at their tax credit calculation, you can see why $18,000 for a 2.5kW fuel cell unit! And you still need the electricty to make your hydrogen. No wonder they can;t compete with battery forklifts! Yes Paul, MeOH or other alcohols can readily blend with crude oil or refined components of crude oil and be easily separated at the ‘first heat’ of the refinery. Major equity participants in Prudoe Bay have not yet realized that the problems they presently have with thick, heavy bitumen-like crude oil could be easily solved by converting their copious volumes of cheap and stranded methane gas via GTL “methanization” (not fischer-tropsch) into methanol or nearly 2x stronger BTU higher mixed alcohols and use this oxycarbon (not hydrocarbon) as the transport and anti-freeze blendstock to move thick crudes down an aging old pipeline presently running far, far below design capacity to the Prince William Sound. Then this mixture of mechanically blended oxycarbon alcohol(s) and hydrocarbon oils can be shipped by tankers to Pacific Rim refineries. First heat at the refinery separates the alcohol(s) from the much thicker oils to be re-utilized as key blendstocks once again when carefully metered back into refined petroleum products. Same practice could occur with thick bitumen Tar Sands being mined/steamed/pipelined/railed from Alberta, Canada. Efficienciy gains typically translate into significant profitability. Perry: You seem to be a fairly recent newcomer to this blog. Hydrogen issues and methanol toxicity issues have been discussed here in rather detailed depth before. I’m not going to provide you which specific urls to unearth such localized dialog, — yet I heartily suggest that you create a brand new thread right here and now to discuss your enthusiam for hydrogen. That way folks who have been there, done that diligence and argued such reasoning – can (if desired) avoid the chaos – chaos which always ensues around hydrogen hallucinations! Hope everyone took a few hours off to enjoy family, a special traditional meal and gave thanks yesterday. Mark – you guessed exactly what I was getting at – the Alaska pipeline. Built for 2mbd, currently 600,000 mbd, and the “cutoff” is somewhere around 300,000mbd. But thin it down and you solve the problem. They could do it with NGL’s, but then what to do you with the methane? Sounds like an opportunity if ever there was one – the pipeline is BIG deal in Alaska, and everyone is dreading the day they shut it down. I have a gallon jug of methanol sitting on a shelf in my garage. The two cars sitting in my garage each have a reservoir of methanol under the hood. It’s been died blue and is called windshield washing fluid. If I walked out in my garage and lifted that jug of windshield washing fluid to my lips and drank, I very well might go blind or die. But I’m not planning to drink it, nor will I let my dog or kids drink it. If I wanted to, I could drive to the big-box store a couple of miles from here and buy all the jugs of methanol windshield washing fluid I wanted and haul them home. In fact, I filled my car with gasoline this morning and I noticed the filling station had a six foot high pyramid of jugs of windshield washing fluid right by the cashier because it’s on sale. If methanol was such a danger to society, why would they do that? If methanol was so dangerous, why would the automakers include a reservoir of blue-tinted methanol under the hood of every car they send to a dealership, and why would it be so easy for me to buy? Mark – you guessed exactly what I was getting at – the Alaska pipeline. ……the pipeline is BIG deal in Alaska, and everyone is dreading the day they shut it down. this Alaskan and other crude oil pipelines. This mechanism (of using a crude oil pipeline in place) to monetize trillions of cubic feet of methane natural gas currently stranded at Alaska’s northern border — is simply waiting to happen. This will take serious money and would immediately jettison all current plans for a brand new multi-billion dollar methane gas pipeline project down to Chicago via the same previously proposed routes which failed only a handful of years ago. Emergence of new value-added GTL biodegradable liquid fuel solutions to be erected in Prudhoe Bay will generate far more money annually for investors than the orignal Capex of the retrofitted project itself. The profit side of a new and environmentally consequential development like this could be enormous. Whether methanol or higher mixed alcohols are utilized will effect the bottom line tremendously. It is plainly evident that Fischer-Tropsch synthetic oils cannot compete. This is a completely different topic herein to discuss. We are moving away from the expiring VEETC EtOH tax credit topic at hand… And like hydrogen hallucinations – perhaps this topic could and should be addressed on another thread entirely? Perhaps a member’s thread which several of us plus this blog’s hosts have previously discussed? Because we’ve decided a certain number of deaths are acceptable. We know 10,000 pets, and 700 children, are poisoned by antifreeze each year. We know there are idiots who will kill their spouses with it. We use it anyway. Hydrogen also presents risks. But, like everything else, we’ll end up balancing that risk with the rewards. And the rewards are a lot bigger than a cheap engine coolant. know anything Perry but you do have a good imagination. risk of death is insignificant. rules to not kill people. Perry does not have to understand. What is the incidence of ethylene glycol poisoning in humans? According to the Annual Reports of the American Association of Poison Control Centers covering 1991 to 1994, about 3,400 poisonings related to ethylene glycol occur each year with about 20% of these incidents reported among children under six. Kit, it would be easier on all of us if you would learn how to google. Or stop drinking. Or both. Wendell was talking about was methanol. hitting a deer. Two different hazards! does not matter if is the result of the energy hazard or toxicity. safe to use. The likely hood of a fatal accident is insignificant. We know 10,000 pets, and 700 children, are poisoned by antifreeze each year. Perhaps that’s true, but coolant antifreeze (what’s known as permanent antifreeze) isn’t made from methanol. The main reasons for the deaths from permanent antifreeze is that ethylene glycol tastes sweet, and when irresponsible people flush their car’s cooling systems on their driveways and let it run down the street, dogs lap it up; or they let an open jug of glycol sit on the floor of their garage and an unsuspecting three-year old thinks it smells, tastes, and looks like Kool Aid. There is no accounting for irresponsible and stupid people. Nor should we write laws to stop the irresponsible and stupid that penalize those who aren’t irresponsible and stupid..
Perry understands just fine. 20,000 Americans die from auto accidents each year. Yet, for some odd reason, we still jump in a car when we need to get somewhere. It’s called acceptable risk Kit. Sure, hydrogen has safety issues. What doesn’t? The US has a long track record of using fuels with safety issues. Somehow, we manage. occurred from ethylene glycol poison, the root cause was cited. good way to kill people unless want to get caught. 20,000 Americans die from auto accidents each year. Off by a factor of nearly one and a half Perry. 33,800 deaths due to autos in 2009 in the U.S. ~ 93 deaths/day. to demonstrate he is clueless. kids are playing in the backyard and are killed by a drunk driver. The drive driver could be held accountable and go to jail. lower than voluntary risk of driving. standards where your kids work to save money Perry? Back to the topic at hand, Vinod Khosla, who claims he has always only ever been in favor of temporary subsidies (big grants are nice! ), has come out and said “[T]he time has now come for us to stop subsidizing corn ethanol.“. Why should the corn ethanol subsidy expire? From a technological and economic standpoint, corn ethanol production has little potential upside left in process cost reduction; public interest subsidies should be used to introduce new competition to markets or support new technologies to get down the early cost curve, not to support mature technologies. Additionally, the subsidies that are in place have enabled some very large businesses to collect hundreds of millions of dollars per year of taxpayer cash without truly fostering, with rare exceptions, new technology development from non-food crops that can scale enough to help wean America off of foreign oil. Corn ethanol has become a dead-end street with little public benefit. The same money could be more effectively spent on emerging cellulosic, non-food biofuel technologies that are in fact being suppressed by corn ethanol’s maturity and subsidies for both the corn and the ethanol. The above was also in Vinod’s statement. Sounds like Robert is getting through doesn’t it? Funny thing about the Khosla claim is that he is saying that corn ethanl is a dead end. A few years ago it was a bridge. That led to me presenting a slide at the 2008 ASPO Conference showing a bridge to nowhere. A few years ago it was a bridge. That “bridge” thing was always marketing and PR spin anyway. If cellulosic ever somehow manages to have any viability, it won’t be because of a “bridge” from corn ethanol. There is no correlation between corn ethanol and cellulosic ethanol, other than that the chemical composition of the final product is the same. The corn ethanol distilleries are built for one purpose only, and would require major investment and re-engineering to switch to producing cellulosic ethanol. I suspect in most cases it would be less expensive to start from scratch rather than to modify a corn ethanol still to produce cellulosic ethanol. I suspect in most cases it would be less expensive to start from scratch rather than to modify a corn ethanol still to produce cellulosic ethanol. Ditto Wendell: I completely agree with you. There remains soooo many misnomers still circulating in the 2nd generation ethanol spin via the lignocellulosic ethanol arena amid terribly confusing tax credit hoopla between VEETC and RFS-2, etc. Just like when iso-butanol is sloppily referred to as (n) butanol. The chemisty sets to produce these different liquid molecules are as different as night and day accompanied by different capex and opex, etc. One thing is certain, higher mixed alcohols are not lignocellulosic ethanol. Just like lipstick on a pig should be redirected towards Hydrogen Hallucinations… I’ll begin by responding just a little to another RR blog here. I’ve been busy and have not read through these discussions for a few daze. While people here are debating a 45c/gal ethanol tax credit, imagine the level of debate in Australia next year when their ethanol tax credit of $1.43/gallon ($0.38/L) expires! The situation is a little bit different there – the tax credit is actually a refund of the 38c/L federal excise tax that is levied on all gasoline and diesel fuel sales. Non gasoline fuels, like LPG, also enjoy the tax exemption, as does biodiesel, etc. There is no federal ethanol mandate, but one state has a 5% mandate, and will go to 10% next year. Even so, ethanol is being used everywhere, at up to 10% (max allowed blend), so if the tax difference is high enough, you do create a market without needing a mandate. Naturally, there is an import tariff on ethanol of 38c/L. So, a tariff on imports of X and not on domestic production of the same, just like the US does, and like I have proposed on oil and oil products. According to Ron, this should be provoking an all out trade war, but Australia is probably just too small to worry about. There is an interesting, but unused loophole in the Australian ethanol rules. The ethanol must be made from biomass, and must be made in Australia, to get the credit. But the biomass does not have to be made in Australia. So, in theory, you could export corn to Australia, and make and sell the ethanol there, at the current market price of about $3.00/gal (btu equivalent to petrol at $4.50/gal). At 2.7gal/bu you get $8.10 worth of ethanol from a bushel of corn, compared to $5.40 at current US prices, plus the DDGs. Probably not worth doing when corn is $5/bu, but if it goes back to $3/bu and ethanol is $1.50/gal – maybe… Would be interesting to see if they decided to close the loophole! I presume the US system works the same, where you can import the biomass feedstock, but it’s just not worth doing that. … imagine the level of debate in Australia next year when their ethanol tax credit of $1.43/gallon ($0.38/L) expires! Paul, to the best of my knowledge, the ethanol tax credit does not end on 30 June 2011 but will be phased down in steps, from 1 July 2011 to 1 July 2015, ending up with an effective excise rate that gives ethanol a long-term 50% excise discount. See slide 9 of this presentation. If you have more recent information, please let us know! I agree that the official site to which you link gives the impression that the whole thing comes to an end next year. But what they may mean only is that the excise rebate of $0.38 per litre lasts only until the end of next June. Australia has no federal blending mandate (only a target, already met), and blending mandates in New South Wales and Queensland, the only states producing the stuff — based mainly on waste starch in NSW, and sugarcane in QLD. On that basis, there is very little incentive for somebody to build a plant using imported maize (corn), especially given the very stringent phyto-sanitary regulations governing imports of plant materials into the country. Ron, I stand corrected, yes the phase out begins then, though, just like here, the ethanol lobby is arguing for an extension, and others re calling for it to be removed completely – they will probably stay the course. My main point there was the size of the credit, which really is just the tax on all fuels. The ethanol industry in Australia has enjoyed a much larger price advantage than the US, and but has still had limited growth, struggles with the same fuel acceptance issues of E85, etc. The NSw gov had set an ethanol target of 2% back in 07, and wanted to raise that to 6% beginning 2011. But they have had to put it back because there is not enough ethanol being produced! The domestic producers are complaining about imports, they want the mandate raised, but the gov doesn’t want to implement a target that won’t be met, etc etc. Just like here, it is very political! (news story here). The real parallel is that ethanol, as a fuel, is being driven primarily mandate (both here and in Aust. ), rather than by customer acceptance, even with generous tax advantages. This, in my opinion, is a problem for the long term future of ethanol, that the ethanol industry has yet to address – that is why they always argue for extension of mandate and tax credit. As for grain imports, yes the quarantine restrictions are a very handy trade protection, though you can still meet them if you really want to. if there is another corn glut in the US, I wouldn’t be surprised to see someone try it. Believe it or not, in the ’90′s, Australia used to import rye grain from Canada. They still do, of course, though under brand names like “Crown Royal” and “Canadian Club” – it’s all about ethanol! Paul, I know full well about the biofuel situation in Australia, having co-authored a detailed study on it in 2008. I would be very surprised. What investor in their right mind would risk that kind of money when a huge proportion of their cost of production is vulnerable to a market — actually, three markets: the oil market, the grain market, and the bulk-carrier market — with such volatility? Besides, there is a big lobby in Australia pushing cellulosic ethanol. It doesn’t have to be an investor, it could be n Aust ethanol producer. The circumstances would be drought in Australia creating high feedstock prices, high oil prices, and a corn glut in the US. If all three happened at once, it could be worth doing. After all, Australia was on the verge of importing grain for animal feed in the 07 drought. The cellulosic lobby can push all they want – but can they do what the US one can;t – actually produce something? I only read the x-summary of your report – what was the response? The circumstances would be drought in Australia creating high feedstock prices, high oil prices, and a corn glut in the US. If all three happened at once, it could be worth doing. Not for long. Remember: the current main producer using grain, Manildra, produces its ethanol as a byproduct of processing wheat and extracting, among other products, starch. What they ferment is starch that would otherwise end up in wastewater. They are set up to process wheat, not maize. In any case, we live in a globalized world. If domestic feedstock prices are high in Australia, so will be grain prices elsewhere in the world. And if oil prices are high, there is a good chance that bulk-carrier rates from Gulf ports to Australia will be, too. Exactly — to keep animals and people fed (for which farmers will pay dearly in the short-term). We were preaching to the choir, at least as far as most of the people in the federal government were concerned. But the media coverage was thin, and the industry itself essentially ignorred the study. Ron, I’ll concede that grain imports for ethanol are only a theoretical possibility, but there is one other circumstance that changes the game – mandates. I’m not sure how they are structured, but if ethanol is needed to meet the mandate, and we have domestic drought, what then? They can import ethanol, but without the tax exemption. Agreed that its different from Manildra’s starch process, but for spomeone to bring in corn, make their ethanol, and then sell the DDGs into a hot local animal feed market could be profitable. If they are importing grain (corn) for cattle feed, it would be worth doing that, I expect. Want to make a friendly wager as to whether it will ever happen? I’ll give you 3:1 odds against. And we settle up with ethanol? Now, we’ll have to make sure we aren’t breaching any international trade rules here on ethanol imports/exports, nor that we are turning RR’s site into an online gambling one! But three to one that it happens in the next three years – I’m in! The payment will be a good Aussie red, of course, unless you are at your HQ in Winnipeg, in which case it is Icewine. These being fine examples of non subsidised, non mandated ethanol industries! We have gotten a little off the original topic here, but since we seem have thread to ourselves, I think that’s OK. Since you are intimately familiar with the Aust biofuels industry, if you were given the ear of the government today, what would you be advising them to do with biofuels/bioenergy, beyond eliminating the excise credit?